The goal of Big Picture San Diego is to expand the understanding of economic development and highlight the innovative ways in which the San Diego community is coming together to build a stronger region for the benefit of all of its residents. At EDC, we feel that the true definition of economic development is reflected in our mission: To maximize our region’s economic prosperity and global competitiveness. We believe that this is best accomplished through thoughtful collaboration and open communication. As we build the blog, the hope is to offer good working examples of economic development and start a new conversation about how San Diego can best use its unique assets to grow jobs and the economy. Dr. Lynn Reaser recently delivered the Fermanian Business & Economic Institute Economic Outlook for 2013. With the election behind us but the fiscal cliff still looming, Reaser sided with many observers to predict that the fiscal cliff will either be avoided or – if it is allowed to happen – would not last longer than a few weeks. However, she pointed out that “if there is no political solution, there will be a market solution.” The government has been running annual deficits of more than a trillion dollars for the last four years and that is not sustainable. California is currently outperforming the nation in job growth. California’s economy continues to see job gains in construction, finance, professional and business services, trade, health care, and leisure and hospitality. The state should add about 275,000 new jobs in 2013, following the estimated 260,000 new jobs created in 2012. In San Diego, job growth should yield a gain of about 29,000 jobs. The growth will be driven by San Diego’s key economic drivers – the military, technology and tourism – and a revival in the housing market. The military continues to be the most important economic driver in San Diego’s economy. Although the region will not totally escape the impact of budget cuts – even under the best case scenario – the most likely outcome for 2013 is for defense dollars coming into the region to hold relatively steady. 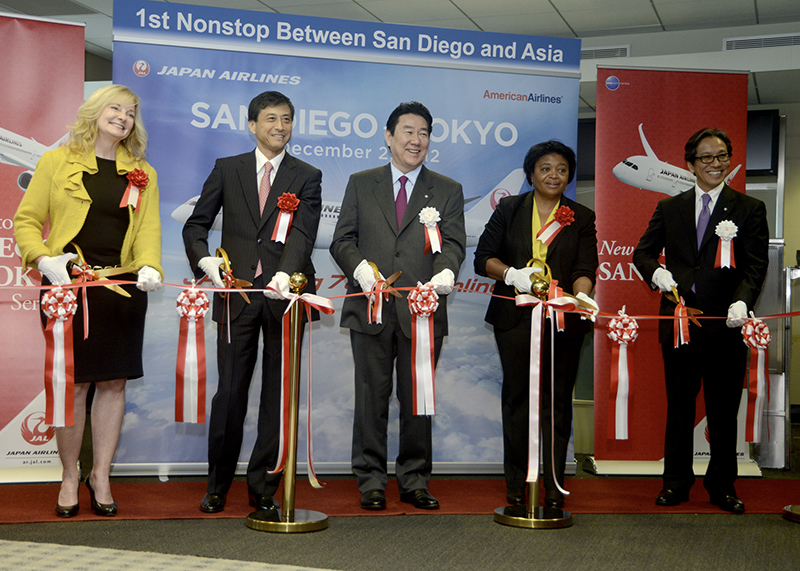 San Diego’s strengths fit very well with a defense strategy that is 60 percent focused on Asia and the Pacific with an emphasis on cyber security and unmanned aerial systems. 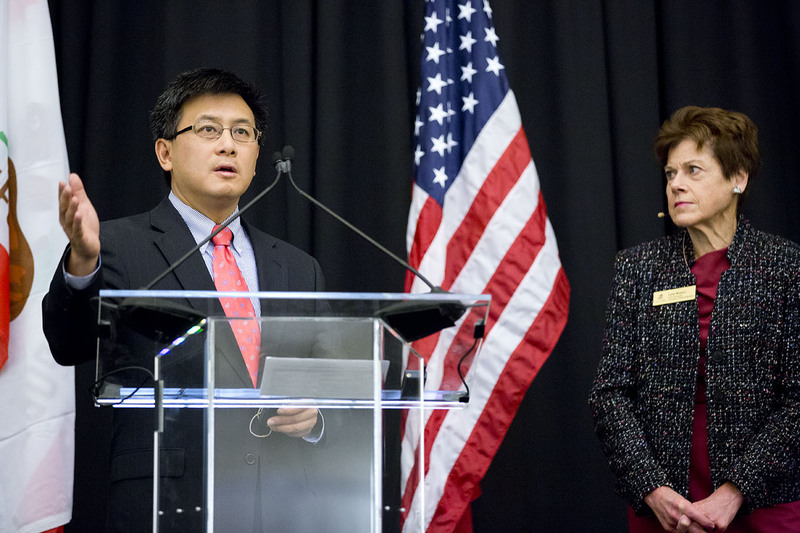 California State Controller John Chiang joined Reaser at the event. Chiang spoke about the challenges he has faced since coming into office in early 2007, including dealing with a cash deficit within seven months of taking over as State Controller. His focus is on determining a competitive tax structure to create a high standard of living while keeping California competitive as a location for business. There was little suspense about the topics when U.S. Senator Dianne Feinstein spoke to a group of business and community leaders recently. Both the Senator and her audience are well aware of the pressing federal issues facing California and the rest of the country. 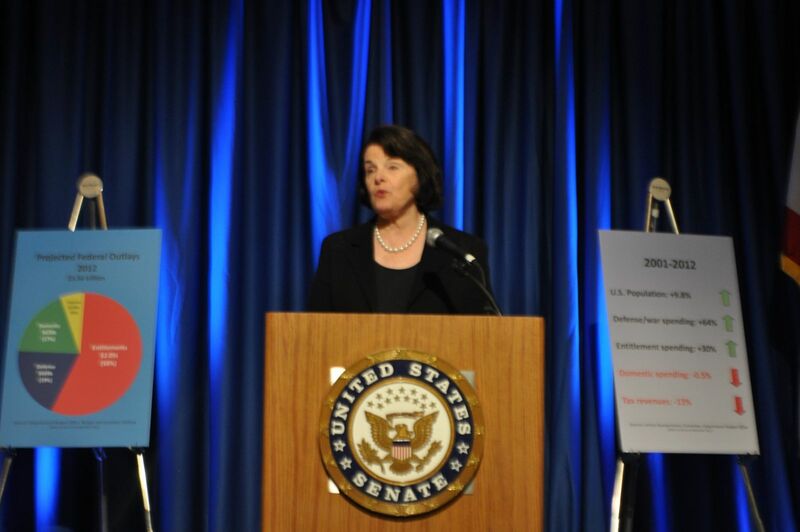 Feinstein came prepared with exhibits to illustrate the changes in spending and revenues between 2001 and 2012 and projected federal outlays for 2012. From 2001 to 2012, defense and war spending increased 64 percent, while tax revenues declined 13 percent. Mandated federal outlays in 2012 (entitlements and interest on the national debt) account for 64 percent of federal expenditures. These figures would be sobering facts in any situation, but the looming threat of sequestration makes the current budget woes seem to pale in comparison. Feinstein has been working with Mark Zandi of Moody’s Analytics to develop a compromise approach that would enact half the cuts (approximately $109 billion) and reduce the projected impact on GDP from three percent to one percent of GDP. She compared the current plan to using a hard cleaver that would throw the U.S. back into recession. Feinstein is advocating for a more targeted approach that she likened to using a scalpel rather than a meat ax. As part of the Senator’s visit to San Diego, she also met in a small group with leaders from the San Diego Regional Chamber of Commerce, CONNECT, San Diego Regional EDC and other local organizations. The briefing included an update on the progress of the Cali Baja Bi-National Mega-Region initiative, initially funded with an Economic Development Administration grant. Feinstein must have been impressed because she said she would like to come back to see more of the mega-region, including a first-ever official visit to Mexico.